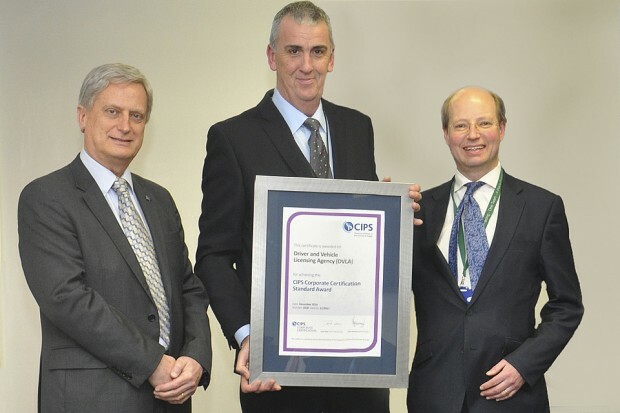 It was my great pleasure to attend a recent ceremony at the Department for Transport (DfT) to receive the CIPS Corporate Certificate on behalf of DVLA. CIPS is the Chartered Institute of Procurement and Supply – the body that represents procurement professionals. The Corporate Certification process examines the procedures, processes and policies of an organisation and benchmarks them against the best in class to assess whether a body is worthy of award. To provide some perspective, around 150 organisations worldwide have reached the standard, and only 6 UK Government Departments have achieved it to date. At the presentation event, Group Director Melinda Johnson spoke of her pride at the collective achievement and the great profile that procurement now has within DfT. This was echoed by our Permanent Secretary Philip Rutnam, who spoke of procurement as moving from a back office function to becoming a strategic enabler. The great news for DfT is that the central procurement team at DfT also attained the award and the Highways Agency attained re-accreditation – so half of the Government recipients are in DfT! While I was the lucky person receiving the certificate, the real credit should go to the team from Commercial Services at DVLA who worked really hard to provide the evidence for 110 different questions! It’s been a great effort, and my colleagues have spent many hours with the assessor providing evidence and testament to satisfy him that we at DVLA are worthy recipients. Here’s a picture of me receiving the certificate from David Noble, the CEO of CIPS, and Philip Rutnam, DfT Permanent Secretary. This recognition of DVLA’s commercial function demonstrates to colleagues and suppliers that we operate to the highest standards of professionalism and integrity, and entitles them to expect to be dealt with professionally and fairly. This is not the end of our journey – the certificate is only valid for three years. But we want to do better, and our aim at DVLA is to go for the Advanced Certificate when we apply for reaccreditation.